We are neck-deep in atrocious spoilers for Unstable and yet the set that’s getting opened this weekend is Iconic Masters. I’m not a marketing or economics major, but it seems something is off about this timing. We’ve known this set for months, a few folks drafted it at HasCon and all I want to do is mess around with Contraptions and Host creatures. There’s another factor at play with Iconic Masters: Somehow, this set is dirt cheap to buy. The EV is there, with 16 rares and mythics that match the price of a pack, but why am I going to drop $30+ on a draft at my LGS when my pals and I can chip in for a box at $160-$170? With this set, I’m not going to buy any boxes or any packs. The far better bet will be to choose the prices I want and see if cards settle to those ranges. The availability of boxes makes me think that this isn’t going to tick prices downward, it’s going to yank the rug out from under them and expose a giant hole. I am open to being wrong, but the box prices are worrisome to me. We’re only going to be opening this for a month (Unstable lands December 9, so four weeks?) so that’s going to mitigate the damage, but I can’t help thinking that this is going to torpedo a lot of prices. Here’s my targets, with their current prices. Mana Drain ($90): So this represents the chase mythic of the set, the headliner, and I think it’s about to tank hard. I think this drop into the $50 range, and $40 wouldn’t shock me. There has been a judge foil, to go with the original, and now the rest of us are going to get a crack at it. Question is, what’s the demand? No one needs a playset, so is it going to be all EDH decks? It’s a pretty phenomenal card in there and in Cube, but that’s going to fill pretty fast. The people who were drooling for a cheaper version are going to get their wish. I will be looking to pick these up around $40-$60. Ancestral Vision ($19): This is a card that has really ridden the rollercoaster over the years. The truth is that while it feels really great to resolve this as a control player, Modern has become a bit too fast for this card. For right now, anyway. I fully expect that in the fullness of time, someone will build a control deck that sweeps away the aggressive decks and defeats the combo players. That time isn’t now, though. I know this will go below $10, but it’ll have to fall further to interest me, maybe to $7. Flusterstorm ($31): This is another card that’s about to take a beating. I can’t find a Legacy or Vintage list that uses more than two, and that’s a bad sign because this is a rare. I think it’s going to drop into the $10 range, and I’m not sure I’d want to pick any up. Where’s the demand? This goes in some Cubes, but it seems like trash in Commander. Aether Vial ($30): We keep getting this card, but never ever in Standard again: Darksteel, FTV, Masterpiece, Modern Masters, and now here. It’s dropped in price before and always recovered well, so I don’t think it’ll fall far. $20 would be my target, especially because when people want this, they want the full set. That bodes VERY well for future demand. 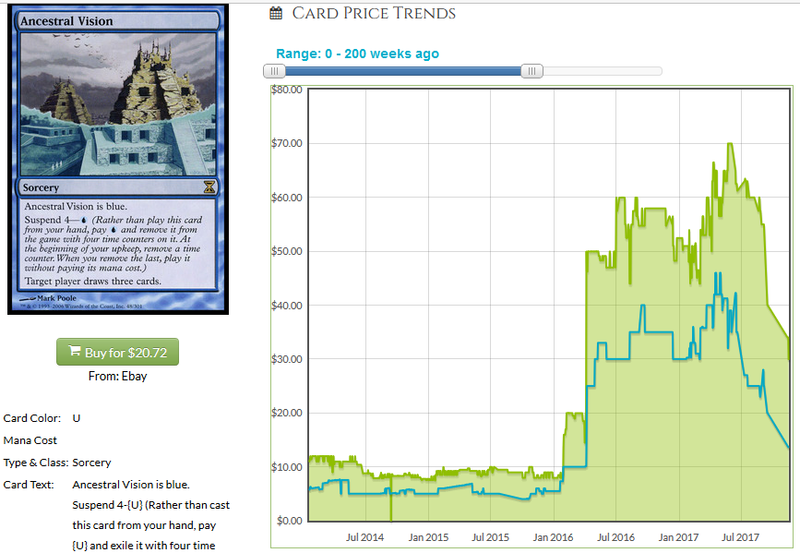 It’s easy to forget that Thoughtseize was worth ninety dollars at one point before being in Theros. 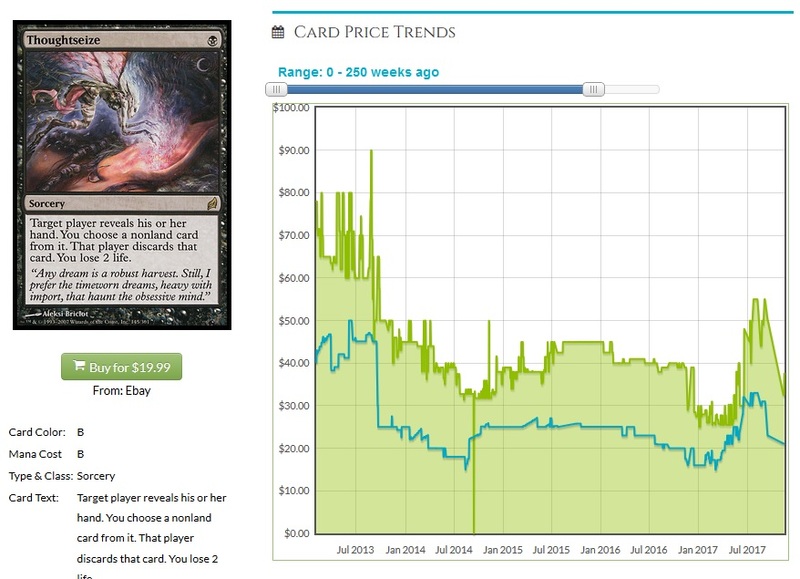 Even now, the original is worth about twice as much as the Theros version. We’re back to the original art and flavor text, which means little when a card is played as much as this is. It’s awful in casual formats, worthwhile in Cubes, and it’s among the most-played cards in Legacy and Modern. The demand is real, but the question of how much supply worries me. Here’s the bottom line: It’s going to trickle down to $10. Will it go lower? I don’t think it will, and I’ll be content to stock up at $10 and wait. It’s played too much to stay that low for long, and if growth is slow, well, I’ll be patient until it gets back to a buylist of $10 and move on. Glimpse the Unthinkable ($12): This is already half the price of the original Ravnica version, and is going to test the premise ‘casuals love mill cards enough to keep prices high.’ This will be a $5 card. It’ll stay a $5 card for quite a while after that, and I won’t want to get any. Cryptic Command ($23): Lorwyn. Modern Masters 1 AND 2. Invocation, and a textless promo. That’s a LOT of printings, and two different alternate looks for those with a taste for either. This sees some Modern play, and that helps, but I can’t help feeling that a lot of people who want a Cryptic or four have them already. This will drop by at least half, and that casting cost is going to rule out a lot of Commander decks…though EDHREC has it in 11,000 decks already. I can’t imagine this stays above $20, and only if it goes below $10 will I be interested. Getting in at $15 and waiting is just going to take too long to be useful.